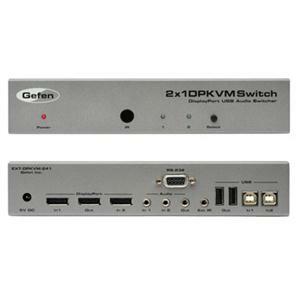 Switch DisplayPort between two computers effortlessly using the Gefen 2x1 DisplayPort KVM Switcher, utilizing one display and one USB 2.0 port for keyboard and mouse. Switch audio, video and control signals for each computer by selection. Access two computers from one workstation without having to use a network. Switch through the front panel "Select" button, using the supplied IR remote control or via the RS232 port.